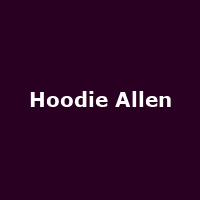 In the last three years, Steven Markowitz - better known as Hoodie Allen - has broken the mould as a hip hop emcee that's not afraid to take risks with eclectic and unpredictable samples and remixes. It's won him many fans. His 2010 release You Are Not a Robot, which borrowed from Marina & the Diamonds' I Am Not A Robot, gained worldwide acclaim hitting the top spot on Hype Machine - meaning it was one of the most blogged about pieces of music on the planet. YouTube views for that track alone have exceeded 3 million. Other samples include Death Cab For Cutie and Two Door Cinema Club, hinting at Hoodie Allen as a rapper with indie sensibilities. The chatter has increased further with his recently released All American EP adding to the hype from 2009's Bagels and Beats and a number of mixtapes, all of which have attracted a huge audience. Shows sell out, websites wobble and, in his own words, Allen continues to make every word count. The forthcoming UK shows will be a test of his growing popularity here and one there can be little doubt he will ace with ease. The short tour kicks off at the O2 Academy in Birmingham on Wednesday 6th June, followed by the Manchester Academy (8th June) and the final date announced so far, an Islington Academy gig on Sunday 10th June. We will have tickets on sale from 9am on Friday 20th April 2012, priced just £10. They are expected to sell out.